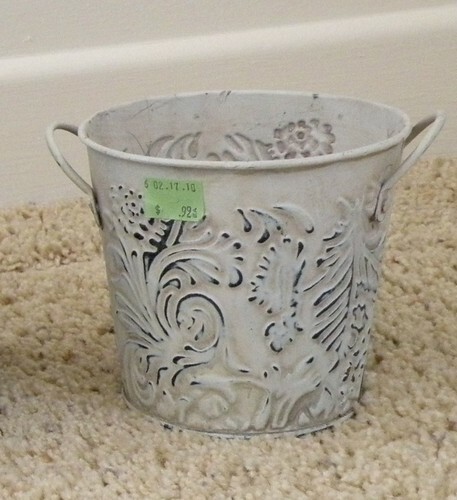 I got this cute little worn out flower pot at G-Will for ninety-nine cents. So easy. Instant cuteness. And it only took me like 3 minutes to paint it. I didn’t even prime it first. I just washed it and then spray painted it. For those of you who don’t live in California, don’t be jealous that it says “Trader Joe’s” on the bottom. 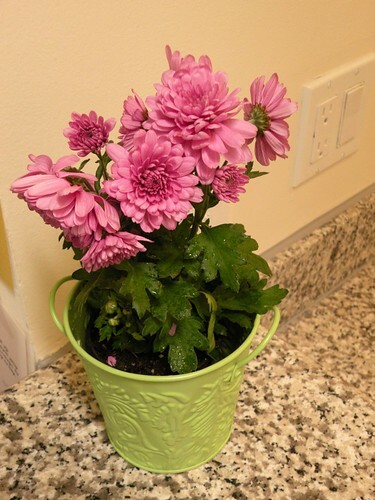 For Mother’s Day my children brought me home this purple flower from the 99 Cent Store. 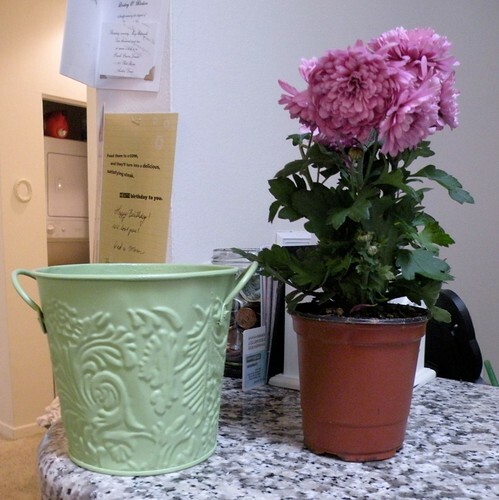 The best thing about this is that I didn’t even hassle with planting my flower in the new pot. I just stuck it in there. It fits perfectly. 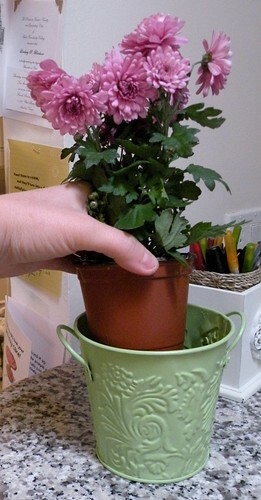 So, two bucks later, I’ve got a cute little potted flower. 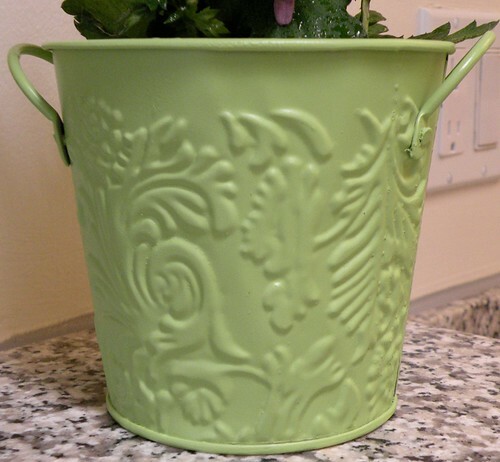 And now I can reuse my planter over and over again. We are CLOSING ON OUR HOUSE at the end of July! Thank you for being patient with me while I’ve been slacking on my blog. It’s been hard to find time to blog while I crash at friends houses. I forgive you. I’ve been at the newspaper so much, it’s been tough keeping up with the blog and leaving comments! I have the day off, my 5 year old daughter is napping, my son is just hanging out, Husband and oldest daughter are at softball practice, I’m blog hopping!! That is so cute! I usually would walk past something like that on a store shelf without a second glance. Not any more! Adorable! I normally walk past stuff like that on the shelf. I’m learning to look at stuff differently though. Fun find. Congrats on the house news. Best wishes that all goes according to plan. 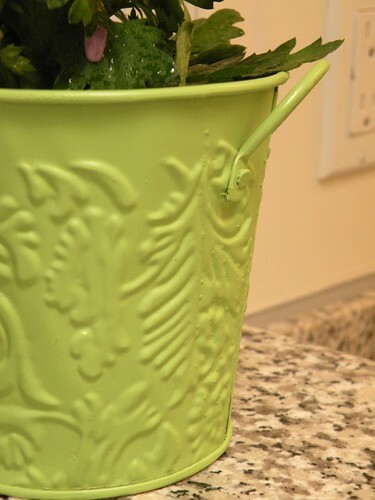 Great minds…all of my containers like that from Dollar General got an apple green bath! And congrats on your house! So exciting!! Really cute pot! And congrats on your closing. That is super!! Congratulations on your purchase contract. Cute! I also would have just passed it. Now I take my time browsing at Goodwill and look for things I could redo or would look cute after a lil makeover 🙂 My only problem now is deciding on spray paint colors. YAY! Congrats on closing your house!!!! It is a beautiful house! Also love that color of green! So fun! Good Luck with the closing and the unpacking when you get in your new home. Would not dream of leaving for your lack of blogging…I just got here and love it! 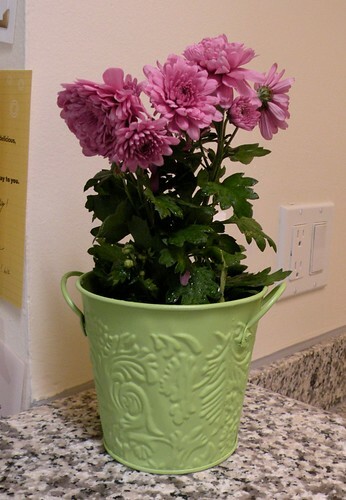 oops…love the cute little green pot you painted…I am so into this color right now..I am going to paint a pie safe I have this color. what a simple transformation, yet so cute! 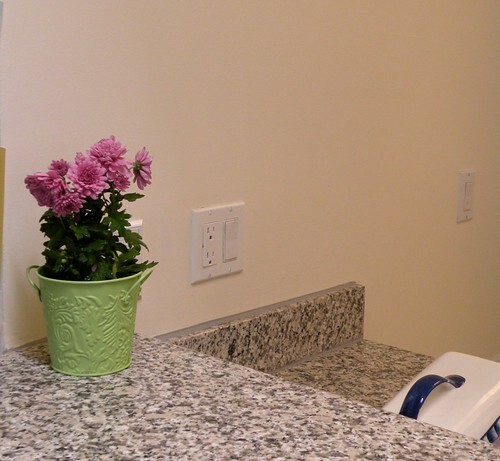 The simplest changes make the biggest impact! Thanks for linking up to Mad Skills Monday!